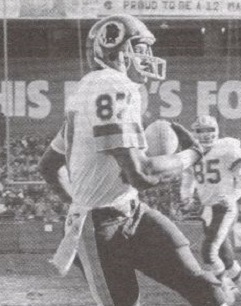 An outstanding receiver on a run-oriented college team, Brown was chosen by the Redskins in the eighth round of the 1981 NFL draft but spent his first year on injured reserve due to a knee injury suffered in the third preseason game. He made an impact in the 1982 season opening game by scoring on a 78-yard touchdown catch, the first of eight TDs in the strike-shortened campaign that saw him pull in 32 receptions for 690 yards (21.6 avg.). Brown caught another 17 passes for 242 yards and two TDs in the postseason as the Redskins won the NFL Championship and he received second-team All-NFL recognition from the NEA and was selected to the Pro Bowl. He became part of a group of capable receivers known as “the Fun Bunch” that were a component of the NFL’s most potent offense. Redskins went 14-2 and finished first in the NFC East while leading the NFL in scoring (541 points) and touchdowns (63). Won NFC Divisional playoff over Los Angeles Rams (51-7) and NFC Championship over San Francisco 49ers (24-21). Lost Super Bowl to Los Angeles Raiders (38-9). Brown suffered through an injury-plagued season in 1984, catching just 18 passes for 200 yards (11.1 avg. ), and was traded to the Atlanta Falcons. Following a mediocre 24-catch season in ’85, Brown rebounded in 1986 with 63 pass receptions for 918 yards (14.6 avg.) and four touchdowns. It was his last hurrah as he caught just five more passes in 1986 and his NFL career came to an end with his release by the Colts in 1988. Brown played arena football in 1990 with the a Washington Commandos and caught 11 passes for 129 yards and two TDs. Overall in the NFL, Brown had 220 receptions for 3548 yards (16.1 avg.) and 25 touchdowns, with 128 of those catches for 2115 yards and 19 TDs coming with Washington. He added another 31 catches for 643 yards (20.7 avg.) and three TDs in eight postseason games. Brown received second-team All-NFL honors once, second-team All-NFC recognition twice, and was chosen to two Pro Bowls.